Alternative flights from London (LHR) with Virgin Atlantic or from London (LGW) with Norwegian are available upon request. 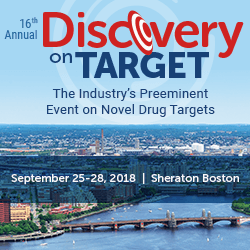 The 16th Annual Discovery on Target, “The Industry’s Preeminent Event on Novel Drug Targets,” will once again gather over 1,300 drug discovery professionals in Boston. The event brings forth current and emerging “hot” targets, technologies and validation strategies for the development of novel small molecules and biologics.